i was going to mention how good things come in three’s, talk about my weird compulsion to reference the 3 oldest kardashians (despite my disinterest in them), then finally get around to talking about how this is my third year participating in sara ‘s / cake over steak’s virtual pumpkin party. but seeing how it’s actually my second year doing this, i now feel inclined to talk about sophomore hits. 22 jump street was better than 21. paramore’s riot! was much more of a success than all we know is falling ever was. so is this pumpkin cranberry raspberry oatmeal better than last year’s waffles with spiced pumpkin butter and walnut brown sugar crumble? maybe. though i’d like to be a fair parent and say that they’re both good in different ways and there’s no possible way that i could pick between two very different recipes. if you’re not in normal oatmeal bc you are a texture fiend and cannot deal with that gluey, gummy mess (wow that’s me!!! ), then baked oatmeal is perfect. it’s more dense and dry and you could stab it with a fork and lift it up if you really wanted to. i definitely ate this pumpkin cranberry raspberry oatmeal using a fork (i couldn’t seem to find a spoon) last week. and in another unstereotypical oatmeal move, this one’s on the tart side with the raspberries and cranberries. i’m trying to eat less sugar, but be my guest and add more brown sugar/maple syrup or sub in sweet fruit if that’s more your style. 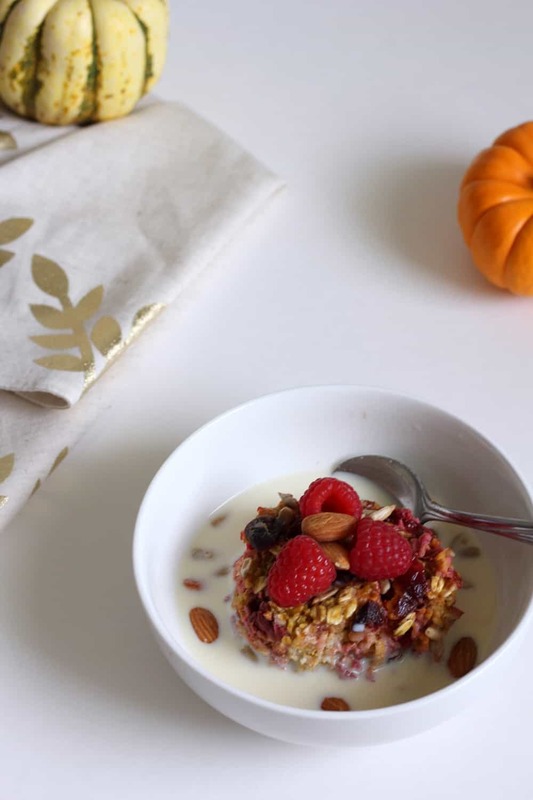 This pumpkin cranberry raspberry oatmeal fulfills its fall quota with the pumpkin, while the cranberry and raspberry keep this tart enough to make it weekday breakfast appropriate. Mix the wet ingredients. Mix into the dry ingredients. Fold in the raspberries and cranberries. Pour into a greased 9” round or 8x8” pan. Evenly spread mixture around the pan and press the fruit down so that they aren’t sticking out. Dollop the cranberry sauce on top of the oatmeal, and use a knife to swirl it into the oatmeal. Bake at 350F for 40 minutes or until center feels firm and edges have browned, or until a knife inserted into the center of oatmeal comes out clean. Cool slightly before serving with raspberries, almonds, pumpkin seeds, milk, or whatever you want with it. Adapted from The Roasted Root. The cranberry sauce is optional, but I like the extra color and cranberry-ness it adds. You can buy it from a store, but I prefer cooking down some fresh or frozen cranberries with some sugar and water until the berries have popped and the liquid has thickened. Calorie information does not include toppings or serving suggestion. I love oatmeal pretty much any way I can get it! I’ll take it gluey and gummy or baked and stab-able 🙂 This sounds delicious, Heather! that’s good you’re an equal opportunity oatmeal lover (: i can get kind of picky about oatmeal (and yogurt) whoops. I don’t think I give oatmeal much of the credit that it deserves. I mean, when you think about it, a single bowl of oatmeal can really carry you to the next meal. That being said I don’t think eat it much simply because of the texture and I’m too lazy to make it myself. But if I would, your version would be the one I go with for sure! mm yeah texture can be a major turnoff (i had an acai bowl yday with almond milk and it was so funky and not smoothie like and my friend compared it to that nickelodeon slime. ick). I love the idea of baked oatmeal because it kind of feels like you’re getting a cookie (or “granola bar” if we want to sound healthier) for breakfast. And who doesn’t want that? And to have a nice pan of it for several days sounds like a tremendous idea! But I’ll eat oatmeal any way I can get it. This one looks a-maz-ing! yeah it makes the oatmeal feel a lot more decadent than it really is. and it’s such a great make-ahead breakfast! that’s so unusual to me (we have canned pumpkin here year round available at most supermarkets), but i’m sure you have things that we don’t see either (: definitely don’t need to use pumpkin here though, and you can sub in more milk or use another thick fruit puree (maybe applesauce?). Oh yum! Baked oatmeal is so comforting in the autumn months. And bonus, you used up the cranberry sauce! After a turkey dinner I can never figure out what to do with it. i really like cranberry sauce on everything lol. yogurt, oatmeal (baked or just stovetop), vanilla ice cream, buttered toast, etc. I personally love oatmeal, baked or otherwise. This sounds like a magical combo!! Yummy! This is an awesome breakfast recipe, Heather! Can’t wait to give it a try! 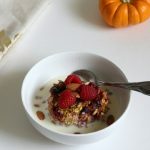 I love berries in my oatmeal..And I totally need to try the berries with the pumpkin! Sounds lovely for fall! I will add a bit of cinnamon to it too :). Also, I agree that 22 Jump Street was better than 21 (although I freakin love both). This oatmeal looks delicious! I don’t normally eat baked oatmeal (I don’t mind eating it gloopy), but I should bake it next time. Great fall flavours too! This looks so good! I usually go for eggs in the morning but Have been on an oatmeal kick lately. WHOA BABY! 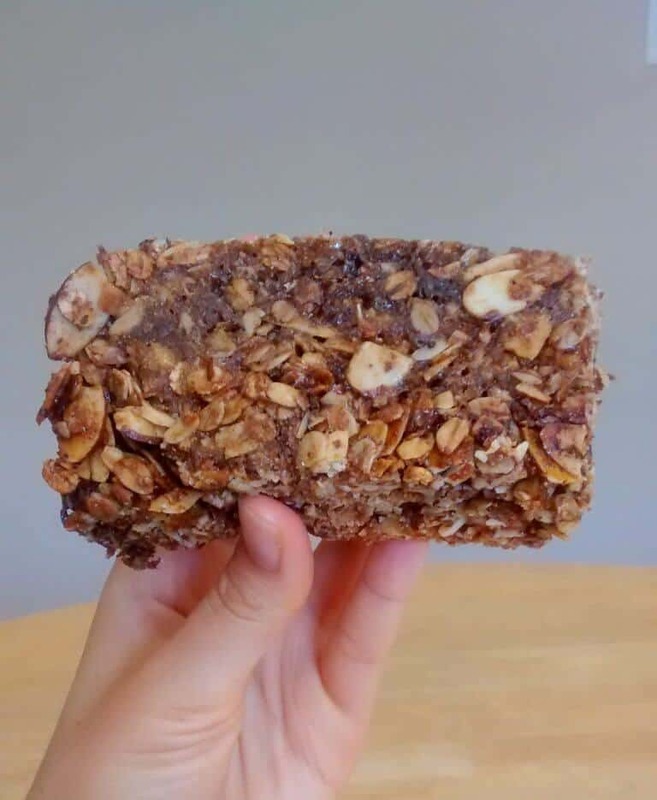 THAT is one hunky oatmeal bar!! LOL have never associated hunky with oatmeal but i dig it. What a thorough recipe and directions! I’ve never tried baked oatmeal, but this sounds delicious. I’ll give this a try next time I bake! Okay, I’m feeling a bit old. I have not seen either of the Jump Streets and the only reason I know Paramore is because they used to be my daughter’s favorite group for a while. I also do know that I need to try baked oatmeal. This version with pumpkin, cranberries, and raspberries sounds delicious! haha i think it’s just easy to feel old/out of it in general (i didn’t/still don’t really get why fidget spinners were so popular with kids). Yes. Finally! We share the same opinion for the normal oatmeal. Haha.This looks so yummy and healthy too. This definitely is a good breakfast. Great recipe, Heather. I will try this very soon. This is a great idea for using pumpkin, the sound so full of autumn flavours. 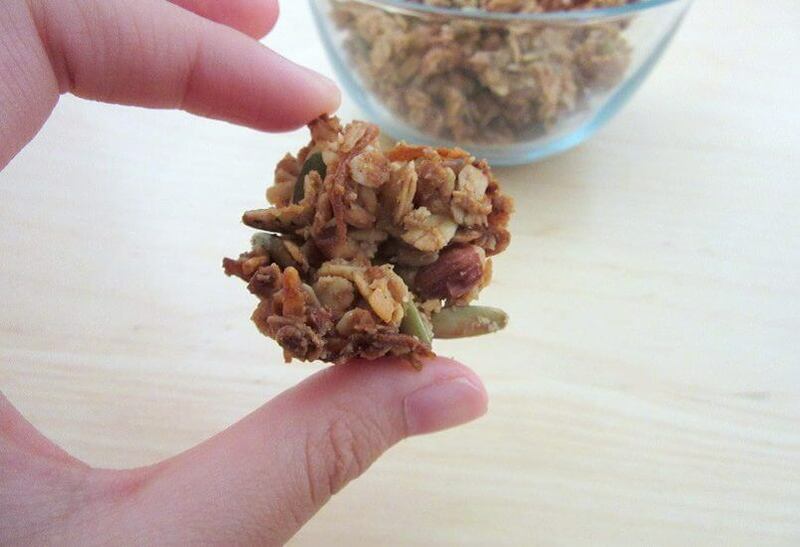 I like the crispiness of baked oatmeal, so this is definitely a recipe for me to try! oooh toasted pumpkin seeds on top sound awesome! i did sunflower seeds here, but anything crunchy/nutty/seedy would be great. alas, I do not enjoy oatmeal at all… though it looks somewhat interesting, I have to say. haha i don’t blame you (; for the longest time, i didn’t like the texture of pancakes (i know, whaaaat?! ), and would just pick out the chocolate chips. GRRRRL we are on the same wavelength about oatmeal texture. Love this recipe, both for the superior texture and the lovely flavors! i feel like there should be an oatmeal council to redo oatmeal’s image lol. I am definitely one of those who cannot deal with the gummy mess. Baked oatmeal is the thing for me and I love this. 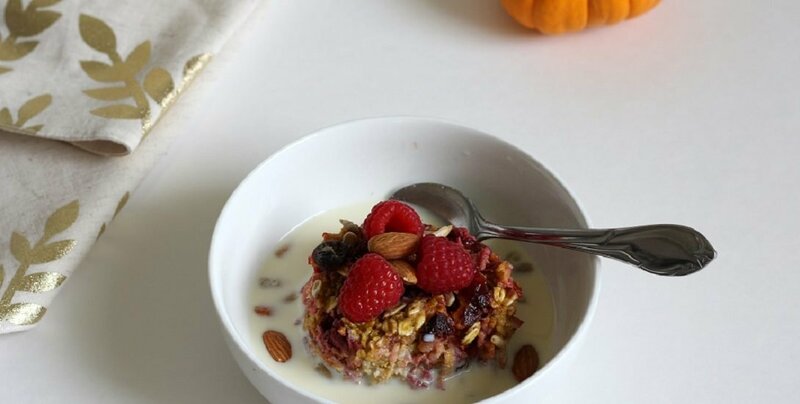 All of fall’s awesome flavors in a little breakfast bowl. Awesome! Hi Heather, thanks for the great inspiration! I love regular oatmeal but will definitely give this a try to switch things up a bit! I’m definitely a baked oatmeal girl!!! I love that it’s almost like cake for breakfast. Thanks for sharing this! like cake for breakfast, only a touch more responsible and healthy (; thanks, sara!